Michigan Poll Has Legalization Initiative With Comfortable Lead . A new Detroit Free Press poll has the Proposal 1  legalization initiative favored by a margin of 57% to 41%. That's nearly unchanged from the previous Detroit Free Press poll in September, which had the issue winning 56% to 41%. "Even though there are some law-enforcement groups and others that are putting out information against the proposal, it seems to have pretty solid support," the pollsters noted. "There has always been a perception that there are far too many people in jail for a minimal amount of use and that it prohibits the police from spending time on more serious crimes." Michigan Marijuana Foes Spending Big Bucks . The organized opposition to Proposal 1, known as Healthy and Productive Michigan, has collected more than $1 million in the past quarter, nearly double the $529,000 raised by the Coalition to Regulate Marijuana Like Alcohol Coalition, which is leading the "yes" campaign. The opposition still has $600,000 in the bank, which it is using for a series of cable TV ads. But the polling suggests the ads aren't working. Smart Approaches to Marijuana (SAM) ponied up more than $600,000 to defeat the measure, while executives from DTE Energy have donated more than $300,000. Oregon County's Lawsuit Challenging State Legalization Thrown Out . A federal judge has dismissed a lawsuit from Josephine County contending that federal law criminalizing marijuana preempts the state's law allowing commercial production and sales. US District Court Judge Michael McShane ruled last Thursday that cities and counties don't have standing to sue a state in federal court. The county has not yet decided whether it will appeal the ruling. FDA Grants "Breakthrough Therapy" Status for Psilocybin to Treat Depression . 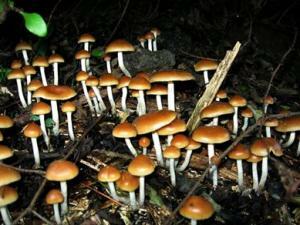 The Food & Drug Administration (FDA) has granted Breakthrough Therapy status to psilocybin -- the psychedelic ingredient in magic mushrooms -- for use in treating depression after early experimental results showed promise. The designation allows the FDA to expedite research and review of psilocybin-based treatments. It is aimed specifically at a Phase IIb trial currently underway investigating the optimal dose range for psilocybin used for severe treatment-resistant depression.